The Cultural and Intellectual Community Program Council (CICPC) selects the annual intellectual theme, funds related programming during the academic year, and selects the summer reading book, which begins our year-long exploration of the intellectual theme. The theme for CICPC sponsored programs in 2016-2017 is “Toward Just and Sustainable Communities”. Faculty, staff, and students from around the college will present speakers, film series, performances, and other events related to the theme. This year’s intellectual theme, “Toward Just and Sustainable Communities,” asks the TCNJ community to explore connections among social justice, sustainability, and community, and to consider these terms expansively and creatively. How do we define community? What are the manifestations of justice in our communities? What do we mean when we talk about sustainability? The theme suggests the power of human agency; we can move “toward” meaningful action. The Summer Reading text, Will Allen’s The Good Food Revolution, describes his project, Growing Power, and honors and celebrates what others have done to promote healthy communities through urban gardens that grow affordable and sustainable “good food.” Grounded in the history of changes in agriculture and the American food system during the Great Migration, Allen’s book serves as a model of the cross-disciplinarity possible in discussions of community, justice, and sustainability. In order to prepare for a faculty or staff led discussion with your peers, choose one of the following questions and respond in a 500 word post to the SRP-099 discussion board in the college’s course management system Canvas . Your short essays should show evidence of your thorough grasp of the book, but you should not quote at length. You must post these responses by Monday, August 15. In addition, respond to three other students’ essays in a substantive way (at least 100 words in each response) prior to your discussion, August 29. Substantive responses may include 1) additional examples that address the same topics that the students discuss; 2) reflections that link your personal experience to the text; 3) questions that you may have regarding students’ essays. 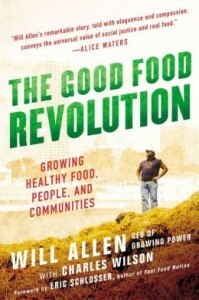 1) In his book, The Good Food Revolution: Growing Healthy Food, People, and Communities, Will Allen tells the story of how his family, like so many other American families, lost the power to grow their own healthy foods and feed themselves when they left rural farms for city life. The title of his book suggests growing healthy food will lead to healthier people and healthier communities, re-empowering them in a “good food revolution.” To what extent do you think this movement can succeed in creating revolutionary changes, both in cities and in your own community? 2) Will Allen uses his family’s history to connect his readers to the Great Migration and the impact that movement from the rural US to urban centers had on African American communities. How does Allen’s storytelling illuminate the connections between race, food, and just and sustainable communities? Discuss specific examples from Allen’s book that best support your answer.